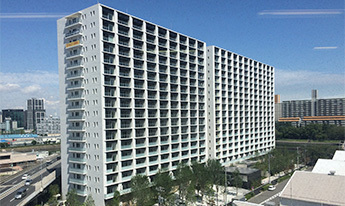 In the real estate business involving the Tokyu Fudosan Holdings Group, since development and operation of houses, office buildings, commercial facilities, resort facilities, etc. are going on for a long time and many stakeholders are involved, we recognize that we need to work on the entire supply chain in cooperation with stakeholders (design companies, construction companies, customers etc.). Also, since we utilize large amounts of resources from the environment for our business activities, we will work on the entire supply chain for energy use, water resources conservation, biodiversity conservation, saving resources, reduction of pollutants and waste and appropriate treatment. 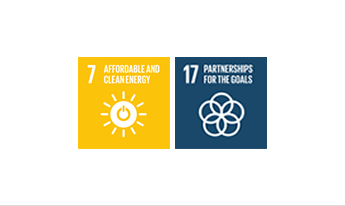 －Energy use－ We will promote the efficient use of energy and the use of renewable energy throughout the entire group and will endeavor to reduce the impact of CO2 / GHG emissions from business activities on climate change. －Water Resource－ In order to properly manage water resources according to region / time and efficiently use water resources , it is necessary to work in cooperation with stakeholders. 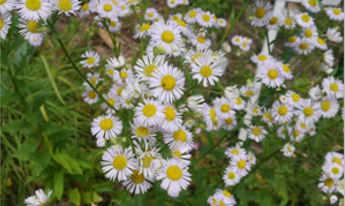 Also, Japan, where many of our business sites are concentrated, has yet to experience chronic water shortage, but in our business activities, we recognize that it is necessary to consider the water resources used for the production of imported materials (so-called “virtual water”). －Biodiversity Conservation－ Land development and materials procurement in our business activities are highly dependent on ecosystem services. Because damaging the ecosystem makes it difficult to receive such service, the Group will conduct appropriate material procurement and ecosystem surveys in collaboration with our stakeholders and work on biodiversity conservation. －Saving Resources－ The Group recognizes that the responsible use of resources is an important environmental issue because global environmental resources are finite. We also believe that it is important to endeavor to use resources more effectively based on an approach incorporating the 3Rs (reduce, reuse, recycle); instead of using vast amounts of resources for our businesses. The Group will work with stakeholders to use resources responsibly and more effectively. －Reduction of Pollutants and Waste and Appropriate Treatment－　The Group recognizes that the reducing emissions of pollutants and waste in business activities is one of the corporate social responsibilities. 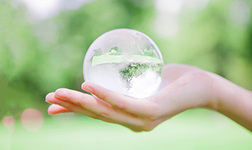 The Group will work to reduce the impact for the environment in cooperation with design firms and construction companies to reduce pollutants and waste discharges, reduce materials causing the pollutants and waste, and apply appropriate treatment when discharging it we will work. Tackling the real estate business in consideration of global environmental issues such as energy use, water resource, biodiversity conservation, resource saving, reduction of pollutants and waste and appropriate treatment will create business opportunities and enhance the competitiveness of the Group. It is based on this awareness that we will work with tenants and other stakeholders to help protect the environment across the entire supply chain of our businesses. The Group has established the CSR Promotion Committee headed by the President & CEO, and to address environmental issues within the supply chain, the Environment/Social Contribution Council, established as a subcommittee, leads relevant management activities across the entire Group. ●The Tokyu Fudosan Holdings Group aims to reduce CO2 emissions per floor area of our business offices 25% compared to FY 2005 by the FY 2020. 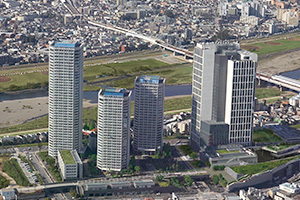 ●The Tokyu Fudosan Holdings Group aims to reduce CO2 emissions per floor area of real estate portfolio 25% compared to FY 2005 by the FY 2020. ●The Tokyu Fudosan Holdings Group aims to reduce CO2 emissions per floor area of our business offices 30% compared to FY 2005 by FY 2030. ●The Tokyu Fudosan Holdings Group aims to reduce CO2 emissions per floor area of real estate portfolio 30% compared to FY 2005 by FY 2030. The Group works with stakeholders to obtain environmental performance certification to improve the environmental practices of its entire supply chain. 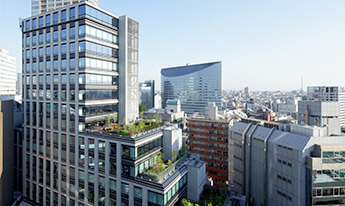 ※Tokyu Land Corporation new large office building and commercial facilities. 《Results》The Group works with stakeholders to obtain environmental performance certification to improve the environmental practices of its entire supply chain. The achievement ratio to the acquisition target in FY 2017 was 100%. 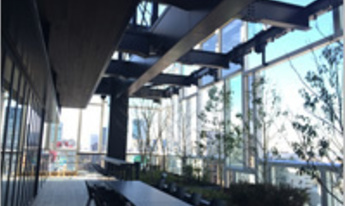 In August 2015, Futako Tamagawa Rise Tower Office (Setagaya City) acquired LEED for New Construction Gold certification through a partnership involving Tokyu Corporation, Tokyu Land Corporation and Setagaya City. 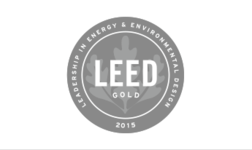 In November 2015, the entire Futako Tamagawa Rise development became the first location in the world to receive LEED for Neighborhood Development Gold certification. 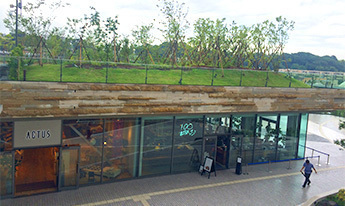 This neighborhood development project received high marks not only for its verdant surrounding environment next to the Tama River, but also for its excellent access to public transportation, high density, compact development, and its initiatives for biodiversity and the more efficient use of energy. 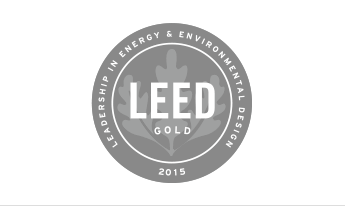 In addition, we are also actively working to acquire CASBEE and DBJ Green Building certification for our residential, office and commercial facility developments as part of our efforts to display environmental performance. 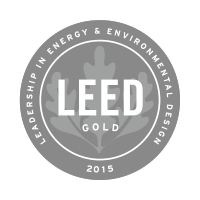 A green building certification program administered by the U.S. Green Building Council. 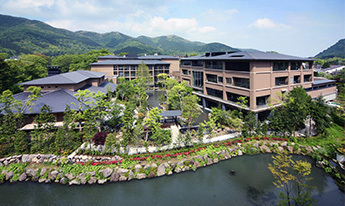 The Tokyu Harvest Club Atami Izusan & VIALA was opened as a resort hotel in harmony with nature in 2013. 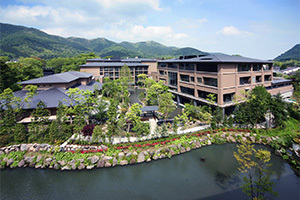 The Tokyu Harvest Club Atami Izusan & VIALA was opened as a resort hotel in harmony with nature in 2013. The resort hotel has been making efforts to conserve water resources through the use of water-saving toilets and reducing the use of tap water by actively using mountain groundwater. At Tokyu Harvest Club Hotel Hakone Koshien and VIALA Hakone Hisui, efforts are also being made to use water effectively through the reuse of underground spring water from the premises. 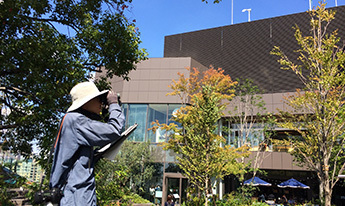 The office building "Kasumigaseki Tokyu Building" developed by Tokyu Land Corporation has introduced facilities to utilize rainwater falling on the roof. The collected rainwater is used for miscellaneous water such as toilet wash water to save water usage. Water retention pavement for suppressing the rise in road surface temperature is laid on a part of the outer structure by thermal evaporation of water vapor, and it is expected that the heat island phenomenon will be mitigated. Tokyu Land Corporation actively employs energy saving equipment and is constantly working to improve the management and operation of equipment that consume large amounts of energy, such as air conditioners. At Abeno Q's Mall in the Abeno Ward of Osaka, Tokyu Land Corporation together with business owners and tenants jointly operates the Motto Save system with Osaka Gas Co., Ltd. that makes it possible to mitigate CO2 emissions. This system aggregates energy usage data for the common space and private space of the mall on a cloud so that business owners and tenants can check, analyze and share findings about the energy usage data of each tenant. 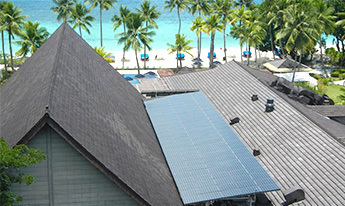 We will continue to work on energy saving measures with the goal of realizing a low-carbon society in the future. 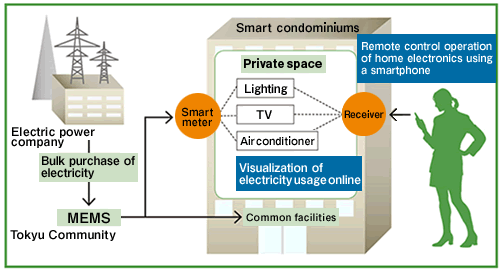 Tokyu Land Corporation installs smart meters for the condominium units it sells to encourage the visualization of energy usage. Tokyu Land Corporation installs smart meters for the condominium units it sells to encourage the visualization of energy usage. 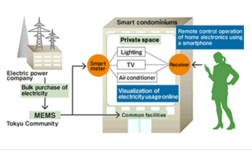 At Branz Sapporo Nakajima Koen, smart meters come standard that automatically read electricity usage data in 30-minute increments using telecommunications. 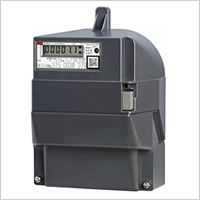 Tokyu Community Corporation has been selected to be an MEMS aggregator as an energy management service provider by the Ministry of Economy, Trade and Industry. 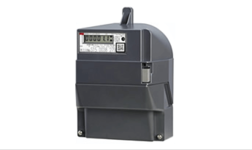 It is adopting MEMS (condominium energy management systems) and bulk high-voltage electricity receiving services (a type of energy-saving system) in the condominiums that it manages. These systems were introduced for approximately 786 housing units during FY2014 as part of efforts to reduce energy use at existing condominiums. 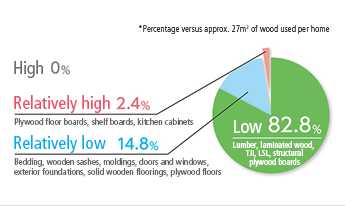 Tokyu Homes Corporation(Newly built housing division), recognizing the importance of working with suppliers to achieve the sustainable use of forest resources, holds seminars respecting the forest environment every year for construction materials manufacturers. Tokyu Homes Corporation will continue to raise awareness about the environment across the supply chain in an effort to realize more sustainable procurement of resources in the future.